In 2003 Vulcan Production Inc. and Road Movies Production produced a series of blues documentaries that Martin Scorsese had produced. One of them, The Road to Memphis, was produced and directed by Richard Pearce and Robert Kenner. 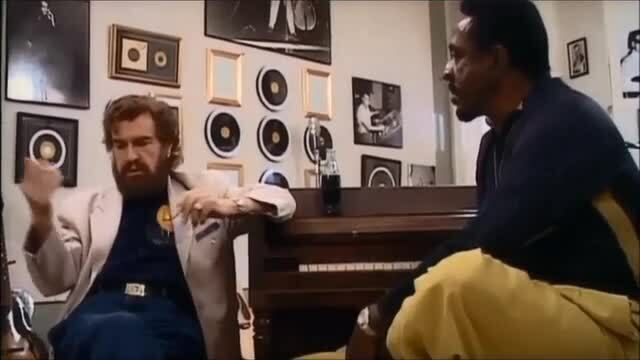 One segment of that episode features a conversation between Sam Phillips and Ike Turner. In the segment, they argue about whites "borrowing" music from blacks. When Phillips suggests that whites didn't copy black music, Ike Turner argues that the songs whites were singing were black and therefore, "They sure did." Phillips then clarifies what he meant by saying that whites didn't "imitate" black singers, but made the music their own. Turner then counters that blacks couldn't get their records on white radio stations, but Phillips did. After viewing, make sure students understand the position of each man. The conversation takes place in Phillips’ old recording studio at 706 Union Avenue in Memphis, Tennessee, the one where he recorded Elvis Presley, Ike himself, and many other musicians like Howlin' Wolf, B.B. King, Junior Parker, Rosco Gordon, Johnny Cash, Jerry Lee Lewis, Roy Orbison, Carl Perkins and many others. The two men obviously know one another and are comfortable with one another. They greet one another warmly and begin talking. They’re seated and facing one another, Ike Turner at the piano bench and play ''Rocket 88'' and Sam Phillips in a chair beside the piano. We have transcribed part of their conversation, though the transcription is a crude one. Here a few screen shots. But you need to see and hear it to get the full effect. What ultimately matters is what these two men do. What they say is only part of that. It’s important, but it’s not all there is. Sam Phillips: And somehow or another God blessed me with the ability to work day and night and hope that I’d be given enough time to stay in business . . . to prove that it absolutely would have to be that some white folks would have to start some things - not trying to copy or anything (muddled) do it with some feeling. I knew that Southern white people like Elvis Presley, ain’t no black person been poorer than him. Ike Turner: All this stuff was black style . . .
Ike Turner: No, no, but just then you said that they didn’t copy the black style. They dead on it. And even today they dead on it. Sam Phillips: What I mean now, the copying, what I meant was trying to imitate. They took the feel because they were exposed to so many of the same things, not to the extent that black people were. But, oh, they didn’t copy. What they did was, they borrowed heavily from . . .
Ike Turner: Yes, they sure did . . .
Sam Phillips: Now, wait a minute now . . .
Sam Phillips: Is that not a compliment? Ike Turner: No no hey! Sam Phillips: That’s what it took to make what you all were doing absolutely accepted. Ike Turner: I understand. But all the other black people that was recordin’, they couldn’t get their records on the white radio stations. You could, you did. Yeah. Sam Phillips: That’s right. (Looks toward the camera) Look at Ike, makin’ fun of me. Do you believe that? Ike gets up, chuckles, says ''I have to go pee'' and leans over Phillips and kisses him on the head and walks off camera while Phillips remains seated and somewhat discomfited. When Ike's off camera Phillips starts singing an Elvis Presley tune: ''Well that's all right mama, that’s all right with me. That’s all right mama, anything you do. That’s all right''. Phillips is now standing up and Turner is back on camera standing next to him and pointing at him: ''That’s the first time I ever heard him sing in my life''. We rather doubt that these two men could have arrived at a mutually satisfactory statement of how matters stand in the very complicated business of black music in white America. But they can and do interact beyond the boundaries of language. That is all we can ask. We can do no more. But we must do that.